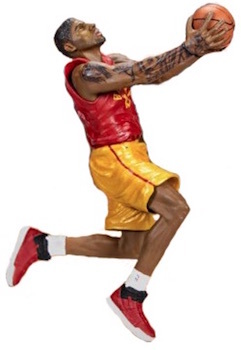 2016 McFarlane NBA 29 Sports Picks features a good mix of new names as well as fan favorites. It may not have the true star power of previous editions, but two key rookie names make their McFarlane debut and are joined by several NBA All-Stars. 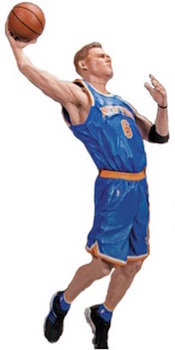 The McFarlane NBA 29 release is led by the first figure options for both Kristaps Porzingis and Karl-Anthony Towns. The rookie duo put forth great rookie seasons and are the clear frontrunners for the 2015-16 Rookie of the Year Award. They are joined by another debut subject in DeAndre Jordan. The big man is not quite a household name but has proven to be an important part of the Clippers squad, making headlines when he changed his mind about signing with the Dallas Mavericks. Shop for McFarlane NBA 29 Figures on Amazon. Several top names also see new editions in 2016 McFarlane NBA 29 Sports Picks. 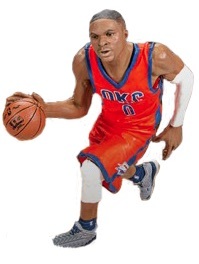 Among the choices with updated sculpts are Kyrie Irving and Russell Westbrook. 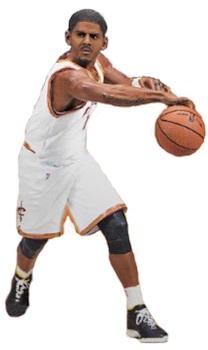 While the sculpt is not new for Paul George, he now sports a Hickory High throwback uniform. Building on the six main releases are four Collector Level chase variants. Each has a uniform change and limited print run range. The exact amount of each figure will be noted on the packaging upon release. Porzingis actually gets double treatment with a Bronze and All-Star version and is joined by Westbrook and Irving at Silver and Gold. Eight-box cases of McFarlane NBA 29 Sports Picks yield one of each figure in addition to an extra Westbrook and one random chase variant. Russell Westbrook Chase McFarlane NBA Series 29 OKC Thunder #0410 1000 MIP VHTF!